This document is copyright 2017 by Brad Weier - permission to copy for personal use only is granted. The giant BattleMid was in trouble. Smoke poured from several joints and its retreat was a stagger instead of a run. The audience of Martians cheered the smaller BattleMid as it chased the larger, unwilling to allow escape. Many years ago, the citizens of Mars realized the foolishness of war between people. Yet they also understood the joy of vicarious mayhem. The perfect solution was combat between BattleMids, remote controlled robots that range from the size of a man to the height of a building. Now, most disagreements end from a safe distance on a BattleMid field. Land ownership, elections, and marriage proposals are all settled by pitting armies of Mids against one another. This has the effect of saving many lives as well as providing great television ratings. Today, the smaller BattleMid moved in for the kill, but forgot to take into consideration the desperation of the larger Mid pilot. The big Mid launched a Cleaver missile that split the smaller Mid into several tiny Mids. Unable to coordinate after such a devastating blow, the tiny Mids bashed into the giant uselessly. The huge Mid crushed them one by one, until a single, tiny blue Mid was left. Haughtily, the large BattleMid walked into position to smash its last opponent, but neglected the edge of the field. It loomed very near. With a quick charge, the small Mid threw its weight into the huge BattleMid, pushing it over the edge of the field where it fell and was crushed under its own weight. Martians all over the planet cheered the underdog, forgetting that the victory meant a new border would be drawn between two bickering nations, a border that would certainly lead to more BattleMid battles. You will also need some sort of Mid Stand to help tell your Mids from your opponents Mids. Cardboard squares or Poker chips work well for this. If you are going to use cardboard as Mid stands, cut the cardboard into squares that are slightly smaller than the squares on the Chess board. Write each player’s name on about ten of these stands. If you are going to use Poker chips as Mid stands, assign a different color chip to each player. In either case, you will need quite a few of these stands for each player, so preparing them before the game is a good idea. All players should “ooh” and “ahh” at very creative stands. You might also want to come up for a reason for the immanent battle. Martian political battles, crusades, and public drunkenness are all good fodder for a BattleMid war. The first step in playing Martian Mids is choosing all of the pieces that you will use to build your Mids. There are three ways to choose, or draft, these pieces. Regardless of the method, each player will build a collection of pyramids that adds up to exactly 30 pips. A pip is the small mark at the base of each pyramid. The small pyramids have one pip, the middle pyramids have two, and the large have three. Place all of the pyramids where every player can reach them. Randomly determine a player to draft first. Drafting proceeds clockwise around the table. Starting with the first player, each player takes one pyramid. Players continue taking pyramids until they have a collection of pyramids that add up to exactly 30 pips. Near the end, you may be forced to “make change” to get exactly 30 pips. Do so by trading in one or two pyramids you have already taken in order to take a remaining pyramid so you have 30 points. You are not allowed to make change unless the remaining pyramid choices would put you over 30 pips. To speed up the draft process, use the partial draft. In this draft, every player begins by taking one of each size and color pyramid. This will give each player twelve pyramids and 24 pips. Next, players use the method described in the full draft to complete their collections so that they add up to exactly 30 pips. For the ultimate in draft strategy, use the no draft option. In this case, every player must have his or her own stashes of red, blue, green, and yellow pyramids. Each player simply chooses exactly 30 pips worth of pyramids from their collection. After the draft, players build their armies of Mids in secret while threatening each other with pain and suffering. A player can have as few or as many Mids as they can build. Espionage is encouraged. >A Mid is a giant Martian robot capable of attacking nearby Mids with hand-to-hand weapons and with the ability to turn parts of itself into missiles. In this game, a Mid is a stack of one or more upright pyramids. A missile is part of a Mid that can strike other Mids at a distance. In this game, a missile is a single pyramid lying on its side. A player’s glass bead is called a Control Bead. During the Assembly phase, each player creates as many Mids as they like. A Mid can be a stack of one or more upright pyramids of any size and color resting on a Mid Stand. A pyramid cannot be stacked upon another pyramid that is smaller than itself. During the game, you can turn part of your Mids into missiles. So, there is no reason to create missals during assembly. All pyramids should be parts of Mids. Any time a Mid loses all of its pyramids, it is destroyed and its Mid Stand is removed from the game. 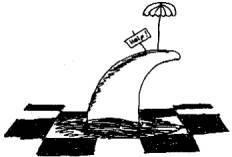 Next, players take turns placing each Mid on a Mid Stand on the Chessboard. The player who owns the largest number of separate Mids places a Mid on any square. You own every Mid that sits on one of your Mid Stands. The player who owns the second largest number of Mids places one next, then the third and so on. (Break ties with a die roll.) Players continue placing Mids in this order until all Mids are on the board. A square can contain only one Mid. If all of the squares on the board are occupied and players still have Mids to place, they will have to put their Mids on top of the other Mids they have already in play, creating larger Mids. After all of the Mids arrive on the battlefield, it is finally time to hand out the beat-downs. The game is played in rounds made up of turns. One round equals initiative, one turn for each player, and missile movement. On a turn, a player either shoots a missile, moves a Mid, or attacks with a Mid. 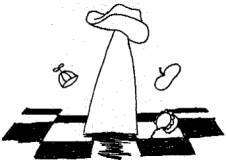 At the end of a round, if no one has won and a stalemate has not occurred, players begin a new round. At the beginning of a round, players set the Initiative Order. The player who owns the largest number of individual Mids at the beginning of the round takes the first turn. The player who owns the second largest number at the beginning of the round takes the second turn and so on. Turn order is set at the beginning of the round and losses during the round affect initiative next round. Use a die roll to break ties. During a turn, a player chooses one Mid she controls, and that Mid must either shoot, move, or attack. Typically, a player controls all of the Mids she owns on her Mid Stands. Control Beads, however, change this (see Yellow Missile Hits below.) If another player’s Control Beads are on your Mid Stand, you do not control the Mid, your opponent does. Furthermore, if one of your Control Beads is on an opposing player’s Mid Stand, you control that Mid for this turn. To shoot a missile, a player chooses a Mid and creates a missile. Note that missiles do not move until the end of the round. To create a missile, choose a Mid, then remove the top pyramid from it. If the Mid was comprised of only a single pyramid, then the Mid is destroyed and the Mid Stand is removed from play. Place the missile in any square adjacent (orthogonal or diagonal) to the Mid Stand. Point it in any direction either orthogonally or diagonally. You may place a missile in an adjacent square containing another missile. Multiple missiles can occupy a square. You may place a missile in an adjacent square containing a Mid. That Mid is hit. See Missile Hits later in these rules. Nice shot, Hawkeye. If the missile does not immediately hit another Mid, it remains on the board and will move at the end of each round. See Missiles Move later in these rules. When a missile enters a square occupied by a Mid, or when a Mid enters a square occupied by a missile, that Mid is hit by the missile. The missile is removed from the game and the victim suffers the effects of the color and size of the missile. Red - Smasher Missile: A red missile removes a number of pyramids from the victim equal to the missile’s pips. These pyramids come off of the top of the victim. For example, a red missile with two pips hits a Mid made up of four pyramids. That Mid loses its top two pyramids. Green - Cleaver Missile: A green missile splits a Mid a number of times equal to the missile’s pips. A green missile with one pip splits a Mid once, leaving two Mids. A green missile with two pips splits a Mid twice, leaving three Mids. A green missile with three pips splits a Mid three times, leaving four Mids. All of the new Mids are owned by the same player that owned the original Mid and Mid Stand. The owner of the Cleaver Missile decides how to split the victim. The splits can take place anywhere in the Mid, creating new Mids of varying sizes. The order of the pyramids, however, cannot change. If a Mid does not contain enough pyramids to be split, then it is destroyed. Split a Mid by removing the first pyramid(s) off of the top of the Mid and placing the new Mid (and a Mid stand) in an adjacent square, either orthoganally or diagonally. Then remove the next pyramid(s) and so on until all of the necessary splits are finished. This will leave the last Mid in the original space. A split Mid may not occupy a square already occupied by another Mid. If there are not enough unoccupied squares adjacent to the victim, then the split can take place only enough times to fill the open adjacent squares. 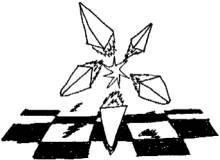 A Mid created by a split may occupy a square already occupied by a missile. Complete all of the splits, then apply the affects of any missiles that strike the new Mids. If there are multiple missiles, apply their effects in Initiative Order. If one player owns multiple missiles, the owner decides in what order to apply the missiles. For example, a green missile with three pips hits a Mid made up of nine pyramids. The player owning the missile splits the Mid three times, creating three new Mids plus the old one. If this missile had struck a Mid comprised of three pyramids, the victim would be too small to be split three times, so would be destroyed. Blue - Shover Missile: A blue missile pushes a Mid a number of squares equal to the missile’s pips in the direction the missile was pointing. If a pushed Mid leaves the board, it is destroyed. 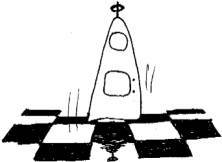 If a pushed Mid enters a square occupied by a missile,the pushing ends and the new missile takes effect. Ignore any squares left in the original push amount. If a pushed Mid enters a square occupied by another Mid, the second Mid is also pushed in the direction of the missile. For example, a blue missile with one pip traveling diagonally hits a Mid. That Mid is pushed one square along the same diagonal. A more complicated example would be a blue missile with three pips hitting a Mid. That Mid is pushed into a square occupied by another Mid. The second Mid is also pushed one square in the same direction. Both Mids are pushed a second square. The second Mid strikes a missile. The pushing ends and the remaining one square from the original Blue Shover Missile is ignored. The second missile takes effect. Yellow - Controller Missile: A yellow missile controls a Mid for a number of rounds equal to the missile’s pips. The owner of the yellow missile places one Control Bead on the victim’s Mid Stand for every pip on the Missile. The owner of the yellow missile now controls the victim. On subsequent turns, the missile owner may shoot, move, or attack using this Mid. At the end of your turn, remove one Control Bead from every Mid Stand that you control. Do not remove a Control Bead if it was generated by a successful Missile attack this round. For example, a yellow missile with two pips strikes a Mid. The player that owned the Missile puts two of his Control Beads on the victim’s Mid Stand. At the end of the controlling player’s next turn, he will remove one bead from the Mid Stand. On the turn after that, he will remove the second Control Bead. Control of the victim would then revert back to the owner of the Mid Stand. In those two turns, the controlling player could have used the victim to shoot, move, or attack. A Mid may move up to a number of squares equal to the number of pyramids it contains. Note, this is not the number of pips, but rather the number of pyramids. A Mid with three small pyramids moves as far as a Mid with three large pyramids. 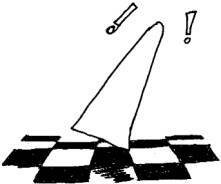 This move may be orthogonal or diagonal. This move must always be in a straight line. Mids cannot change direction during a move. Mids cannot move off of the board. Mids may move less than their full move however they may not move zero squares. 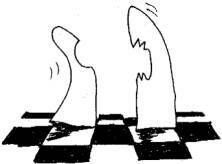 A Mid can attack another Mid in an orthogonal or diagonal adjacent square. The color of the top pyramid in the attacking Mid determines the type of attack. The size of the attacking Mid determines the strength of the attack. Size is determined by adding all of the pips in the Mid. Note that the attacking Mid does not lose it’s top pyramid when attacking, only when firing a missile. Attacks operate similarly to missiles with one and two pips. Red - Smash Attack: If the attacking Mid has more pips than the victim, this attack removes 2 pyramids from the victim. If the attacking Mid has equal or fewer pips than the victim, this attack removes 1 pyramid from the victim. These pyramids come off of the top of the victim. Green - Cleave Attack: If the attacking Mid has more pips than the victim, this attack splits the victim two times. If the attacking Mid has equal or fewer pips than the victim, this attack splits the victim once. Blue - Shove Attack: If the attacking Mid has more pips than the victim, this attack pushes the victim two squares. If the attacking Mid has equal or fewer pips than the victim, this attack pushes the victim one square. This push must be in a direction directly away from the attacker. For example, if a Mid pushes another Mid in an adjacent, diagonal square, the victim moves one or two squares away on that diagonal. Yellow - Control Attack: If the attacking Mid has more pips than the victim, the attacker places two of her Control Beads on the victim’s Mid Stand. If the attacking Mid has equal or fewer pips than the victim, the attacker places one of her Control Beads on the victim’s Mid Stand. If there were any other Control Beads on the Mid Stand, remove them. At the end of your turn, remove one of your Control Beads from each opposing Mid Stand that has them. Do not remove any beads placed this round. If a Mid Stand has more than one of your Control Beads, remove one and leave the rest. If a Mid Stand has only one of your Control Beads, remove it, and control returns to the player that owns the Mid Stand. At the end of a round, after every player has taken a turn, all missiles on the board move. They move a number of squares equal to their pips in a straight line in the direction they point. Missiles may hit Mids or fly off the board during this move. For example, a blue pyramid with three pips pointing diagonally will move three squares in a straight line on the diagonal it is pointing. If the board contains multiple missiles, they move in the Initiative Order the players used during the round. If a player owns multiple missiles, she decides the order in which her missiles move. If the missile travels its full move without entering an occupied square, it remains on the board pointing in the same direction. If the missile travels off the board, it is considered destroyed and out of the game. If the missile enters a square with another missile, the two missiles ignore each other and continue traveling normally. Multiple missiles can occupy a square. If the missile enters a square with a Mid, that Mid is hit. See Missile Hits earlier in these rules. A player wins Martian Mids if he or she is the last player who owns Mids on the board. A Martian Mids battle may end in a stalemate. A stalemate occurs when every player with Mids on the board agrees that no number of rounds will result in a winner. A stalemate also occurs if there are no Mids at all left on the field. The Martian audience especially enjoys this level of carnage. The overwhelming popularity of Martian Mids collided head-on with the Martian Collectible Card Game Explosion to produce the first expansion for the game. Players may want to play at least a few games of Martian Mids before adding this expansion as it greatly changes the flavor and strategy of the game. A Mid Card is a playing card used during a Martian Mids game to break one or more rules for a limited time. If the text on a Mid Card contradicts the rules, assume the text on the card is correct. Before the pyramid Draft, players should draft Mid cards. Players should then Draft, Assemble, and Place their Mids normally. Shuffle one complete set of Expansion 1 cards and deal the agreed upon number to each player face down. Beginning with a random person and moving to the left, each player picks a single Mid Card without showing the others. Players take turns picking cards until each as the agreed upon number. Each player has his or her own library of Mid Cards. They simply pick the cards they desire so up to the agreed upon number of Mid Cards. A player may play as many Mid Cards as he wishes during his Turn. He may play Mid Cards before or after Moving, Shooting, or Attacking. Players should announce when their turn is over. Players may not play cards if it is not their turn. After playing a card, place the card in a discard pile. Players may not reuse cards once they place them in the discard pile. A turn consists of a single action, Attacking, Shooting, or Moving, and the play of Mid Cards. A round begins with determining the Initiative Order, each player taking a turn in order, and missiles moving. The current Turn ends when a player announces his turn has ended. The current Round ends when the final missile has moved and its effects have been determined. Choose one Mid you own. Missiles and attacks cannot affect that Mid during this Round. Missiles hitting the Mid are removed with no affect. Choose two Mids you own. They exchange places. Choose one Mid you own. If you move that Mid on this Turn, it may move through occupied squares with no effect. The move must end in an unoccupied square. Choose one missile you own. Immediately change the direction in which the missile points. Choose one Mid you own. You may take the top pyramid of this Mid and place it on top of an adjacent Mid you own. Pyramids may not be placed on smaller pyramids. Choose one Mid you own. Announce one color. The top pyramid of this Mid acts as the announced color until the end of this Round. Exchange this card for any card in any player’s discard pile. 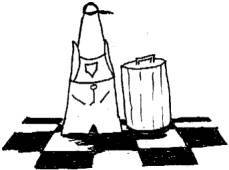 You may look through the discards. Choose one Mid you own. For the purposes of Attacks, the total number of pips in this Mid is doubled for this Round. Choose one Mid you own. Split that Mid as though it were affected by a Green Cleaver Missile. You can split 1, 2, or 3 times. Choose one Mid you own. Move that Mid in a direction of your choice as though it were affected by a Blue Shover attack. You may choose 1, 2, or 3 spaces. Choose one Mid you own. If you move that Mid during this Round, you may make as many turns as desired during the move. This does not give you extra movement. Choose one Mid you own. Choose one Mid owned by another player. Place 1, 2, or 3 of your Control Beads on the other player's Mid, removing any already present. Place the same number of Control Beads from that player on your own Mid, removing any already present. Choose one Missile you own. That Missile is considered to be 4 pips large until the end of this Round. The Missile must be on the board and able to move during the Missiles Move portion of the round. On your turn this round, you may Move, Shoot, or Attack with two Mids you control rather than one. Each Mid can do one thing. You may not use the same Mid twice. Choose one Mid you own. You may rearrange the order of the pyramids within that Mid. No pyramid may sit on top of a smaller pyramid. Choose one Mid you own. For the purposes ofMovement, the number of pyramids in this Mid is doubled. Choose one Mid you own. If you move that Mid on this turn, it may move off of one side of the board and appear on the opposite side of the board. This costs one square of movement. Choose one Mid you own. Make the first eight pyramids of the Mid into Missiles. If there are eight or fewer pyramids in the Mid, make as many as possible and the Mid is considered destroyed. Choose one Mid you own. Remove all Control Beads from that Mid. Rearrange the Initiative Order for this Round. You may play this card only after the Initiative Order is set and before the first turn. The basic idea behind Martian Mids came from my desire to introduce one of my favorite game mechanics into the Icehouse world - deck building. Although I am rarely happy with the way collectible card games are produced and marketed, I like the idea of building a deck before a game. It turns a single card game into two games, the first one where you prepare and hone a strategy and then the second one, the actual card game itself. Deck construction began as army construction in miniature wargaming. So Martian Mids is sort of a miniature war game for pyramids. This is the first game I’ve ever designed. Our playtests showed that, while this is not a revolutionary game on the scale of Zendo or Icehouse, it is not obviously broken and is fairly fun. Not bad for a first time out. The Fifth Draft of the game has some small rule improvements. I applied the Initiative Order count to missile movement to avoid the problems of simultaneous hits. I made one missile’s effects override early missile’s effects to avoid confusion when a Blue Shover Missile pushes a Mid into another missile. The big change, however, is the Mid Cards. This first expansion of the game really changes how it plays. The standard version of the game has some nice chaos in the beginning that evolves into thoughtful strategy over time. With the cards, things stay pretty chaotic to the end. Cards like Missile Abondanza and Again! Again! create all kinds of havoc and complicated situations. The cards have the unintended benefit of ending games decisively. A simple card like Gotta Split allows you to corner a weak opponent and still get a shot off in the same turn. Although Martian Mids didn’t pick up legions of fans, I enjoyed thinking up the cards and toying around with breaking my carefully constructed rules. I was delighted to see my play-testers enjoy the game even more with the new chaos. I have begun thinking about a second expansion for the newer Icehouse pyramid colors. I think there is significant room left for more Mid Cards, including ones that affect entire games rather than just individual Rounds. Remove Beads - Remove one Bead from every Mid.